Combining optimum comfort with maximum head protection, the Draeger HPS 6200 is believed to be the lightest helmet of its kind approved to EN 443. Designed to safeguard firefighters in even the most extreme environments, this head protection system incorporates a full face visor and is fully compatible with Draeger breathing apparatus and communications equipment. Offering excellent protection against impact and penetration, the helmet shell is made from temperature resistant, SMC pressed, Duroplastic and is able to withstand intense heat from open flame and radiant sources. A flame-resistant, washable inner lining and acoustic sensitivity within the ear area ensure maximum wearer comfort, and additional padding can be easily integrated into the helmet to accommodate smaller head sizes (50 and 51). Developed to protect the entire face, the amber-tinted visor extends down to the chin area and is made of a particularly robust, thermally stable polysulfone material. Easily opened and closed with specially designed tabs, even when wearing thick firefighting gloves, the visor also features an anti-scratch coating on both sides. Easily and quickly connected to a full face mask using S-fix, f2 Supra-adapter and PN-Supra fixing systems, it can also be connected to the new Draeger FPS 7000 full face mask via a new Draeger Q-fix self-securing mechanism. Other features include a long, adjustable, 3-point chin strap and a washable, easily replaced headband made of “eco leather” for optimum comfort and hygiene. The large front plate can also be exchanged as and when required to allow different identification symbols to be used, and optional, flame-resistant strips can be supplied to meet specific brigade requirements. Available in a wide range of colours, it can also be fitted with a range of neck curtains as well as lamps and lamp holders. Weighing just 1,365g, the HPS6200 meets the requirements of EN443 as well as Nord Test and mask-helmet combination to DIN 58610. 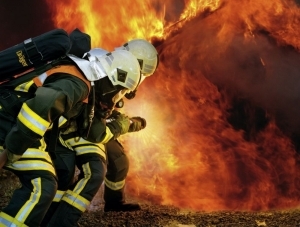 It forms part of the comprehensive Draeger range of personal protective equipment for firefighters which includes self-contained breathing apparatus, electronic monitoring units, entry control systems, chemical protection suits, cooling vests and gas detection equipment. Draeger Safety division offers products, services and system solutions for all encompassing Risk Management such as personal and facility protection. Customised system solutions include workshops, training and breathing gas management systems, diving, rescue and high temperature training systems, and tunnel rescue trains.